Selective disclosure credentials allow the issuance of a credential to a user, and the subsequent unlinkable revelation (or ‘showing’) of some of the attributes it encodes to a verifier for the purposes of authentication, authorisation or to implement electronic cash. While a number of schemes have been proposed, these have limitations, particularly when it comes to issuing fully functional selective disclosure credentials without sacrificing desirable distributed trust assumptions. Some entrust a single issuer with the credential signature key, allowing a malicious issuer to forge any credential or electronic coin. Other schemes do not provide the necessary re-randomisation or blind issuing properties necessary to implement modern selective disclosure credentials. No existing scheme provides all of threshold distributed issuance, private attributes, re-randomisation, and unlinkable multi-show selective disclosure. 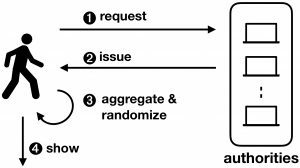 We address these challenges in our new work Coconut – a novel scheme that supports distributed threshold issuance, public and private attributes, re-randomization, and multiple unlinkable selective attribute revelations. Coconut allows a subset of decentralised mutually distrustful authorities to jointly issue credentials, on public or private attributes. These credentials cannot be forged by users, or any small subset of potentially corrupt authorities. Credentials can be re-randomised before selected attributes being shown to a verifier, protecting privacy even in the case all authorities and verifiers collude. The lack of full-featured selective disclosure credentials impacts platforms that support ‘smart contracts’, such as Ethereum, Hyperledger and Chainspace. They all share the limitation that verifiable smart contracts may only perform operations recorded on a public blockchain. Moreover, the security models of these systems generally assume that integrity should hold in the presence of a threshold number of dishonest or faulty nodes (Byzantine fault tolerance). It is desirable for similar assumptions to hold for multiple credential issuers (threshold aggregability). Issuing credentials through smart contracts would be very useful. A smart contract could conditionally issue user credentials depending on the state of the blockchain, or attest some claim about a user operating through the contract—such as their identity, attributes, or even the balance of their wallet. As Coconut is based on a threshold issuance signature scheme, that allows partial claims to be aggregated into a single credential, it allows collections of authorities in charge of maintaining a blockchain, or a side chain based on a federated peg, to jointly issue selective disclosure credentials. Coconut is a fully featured selective disclosure credential system, supporting threshold credential issuance of public and private attributes, re-randomisation of credentials to support multiple unlikable revelations, and the ability to selectively disclose a subset of attributes. It is embedded into a smart contract library, that can be called from other contracts to issue credentials. The Coconut architecture is illustrated below. Any Coconut user may send a Coconut request command to a set of Coconut signing authorities; this command specifies a set of public or encrypted private attributes to be certified into the credential (1). Then, each authority answers with an issue command delivering a partial credentials (2). Any user can collect a threshold number of shares, aggregate them to form a consolidated credential, and re-randomise it (3). The use of the credential for authentication is however restricted to a user who knows the private attributes embedded in the credential—such as a private key. The user who owns the credentials can then execute the show protocol to selectively disclose attributes or statements about them (4). The showing protocol is publicly verifiable, and may be publicly recorded. We use Coconut to implement a generic smart contract library for Chainspace and one for Ethereum, performing public and private attribute issuing, aggregation, randomisation and selective disclosure. We evaluate their performance, and cost within those platforms. In addition, we design three applications using the Coconut contract library: a coin tumbler providing payment anonymity, a privacy preserving electronic petitions, and a proxy distribution system for a censorship resistance system. We implement and evaluate the first two former ones on the Chainspace platform, and provide a security and performance evaluation. We have released the Coconut white-paper, and the code is available as an open-source project on Github. Coconut uses short and computationally efficient credentials, and efficient revelation of selected attributes and verification protocols. Each partial credentials and the consolidated credential is composed of exactly two group elements. The size of the credential remains constant, and the attribute showing and verification are O(1) in terms of both cryptographic computations and communication of cryptographic material – irrespective of the number of attributes or authorities/issuers. Our evaluation of the Coconut primitives shows very promising results. 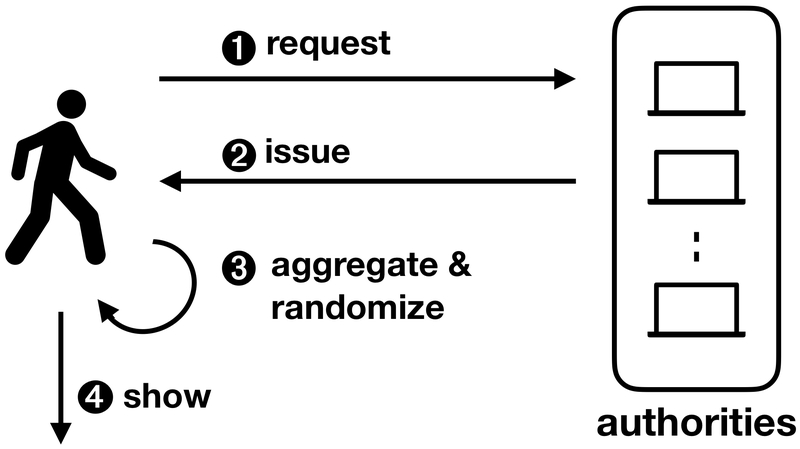 Verification takes about 10ms, while signing an attribute is 15 times faster. The latency is about 600 ms when the client aggregates partial credentials from 10 authorities distributed across the world. Existing selective credential disclosure schemes do not provide the full set of desired properties needed to issue fully functional selective disclosure credentials without sacrificing desirable distributed trust assumptions. To fill this gap, we presented Coconut which enables selective disclosure credentials – an important privacy enhancing technology – to be embedded into modern transparent computation platforms. The paper includes an overview of the Coconut system, and the cryptographic primitives underlying Coconut; an implementation and evaluation of Coconut as a smart contract library in Chainspace and Ethereum, a sharded and a permissionless blockchain respectively; and three diverse and important application to anonymous payments, petitions and censorship resistance. We have released the Coconut white-paper, and the code is available as an open-source project on GitHub. We would be happy to receive your feedback, thoughts, and suggestions about Coconut via comments on this blog post. The Coconut project is developed, and funded, in the context of the EU H2020 Decode project, the EPSRC Glass Houses project and the Alan Turing Institute. Why do we need security on wearable devices? The primary reason comes from the fact that, being in direct contact with the user, wearable devices have access to very private and sensitive user’s information more often than traditional technologies. The huge and increasing diversity of wearable technologies makes almost any kind of information at risk, going from medical records to personal habits and lifestyle. For that reason, when considering wearables, it is particularly important to introduce appropriate technologies to protect these data, and it is primary that both the user and the engineer are aware of the exact amount of collected information as well as the potential threats pending on the user’s privacy. Moreover, it has also to be considered that the privacy of the wearable’s user is not the only one at risk. In fact, more and more devices are not limited to record the user’s activity, but can also gather information about people standing around. This blog post presents a flexible privacy enhancing system from its architecture to the prototyping level. The system takes advantage from anonymous credentials and is based on the protocols developed by M. Chase, S. Meiklejohn, and G. Zaverucha in Algebraic MACs and Keyed-Verification Anonymous Credentials. Three main entities are involved in this multi-purpose system: a main server, wearable devices and localisation beacons. In this multipurpose architecture, the server firstly issue some anonymous credentials to the wearables. Then, each time a wearable reach a particular physical location (gets close to a localisation beacon) where it desires to perform an action, it starts presenting its credentials in order to ask the server the execution of that a particular action. 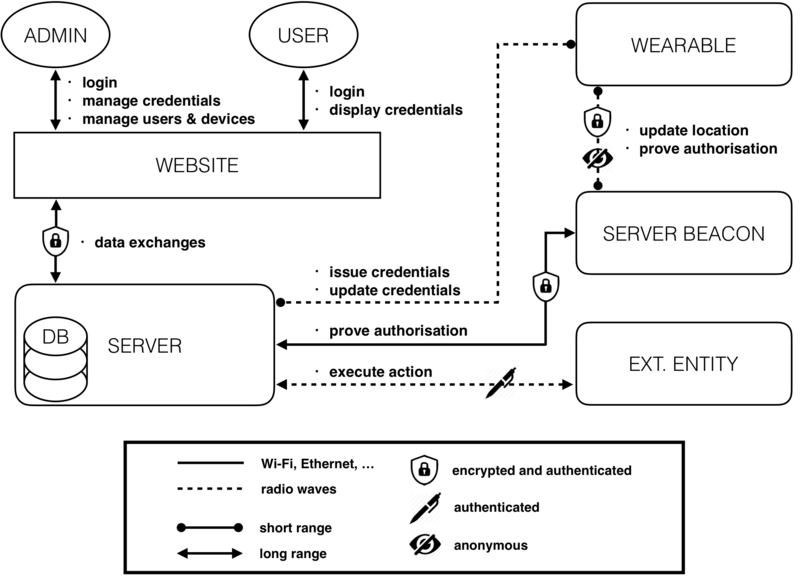 Both the design of the wearable and the server remain generic and scalable in order to encourage further enhancements and easy integration into real-world applications; i.e., the central server can manage an arbitrary number of devices, each device can posses an arbitrary number of credentials and the coverage area of the localisation system is arbitrarily extendable. The complete system’s architecture can be modelled as depicted in the figure below. Roughly speaking, a web interface is used to manage and display the device’s functions. Each user and admin access the system from that interface. During the setup phase, the server issues the credentials to a selected device (according to the algorithms presented in Algebraic MACs and Keyed-Verification Anonymous Credentials) granting it a given privilege level. The credentials’ issuance is a short-range process. In fact, the wearable needs to be physically close to the server to allow the admins to physically verify, once and for all, the identity of the wearables’ users. In order to improve security and battery life, the wearable only communicates using extremely low-power and short-range radio waves (dotted line on the figure). The server beacons can be seen as continuities of the main server and have essentially two roles: the first is to operate as an interface between the wearables and the server, and the second is to act as a RF localisation system. 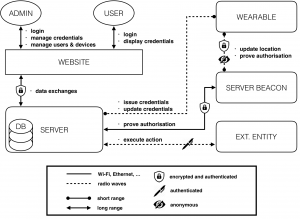 Each time the wearable granted with enough privileges reaches some particular physical location (gets close to a localisation beacon), it starts presenting its credentials in order to prove to the server that it possesses credentials over some attributes (without revealing them), and that these credentials have been previously issued by the server itself. Note that the system preserves anonymity only if many users are involved (for each privilege level), but this is a classic requirement of anonymous systems. Finally, once the credentials have been successfully verified by the server, the server issues a signed request to an external entity (which can be, for instance, an automatic door, an alarm system or any compatible IoT entity) to perform the requested action.